Help! Is there a nanny on the plane? Well, depending on whom you're flying with, some families can make sure they've got an extra hand during long-haul flights. On Sunday, Etihad Airlines launched their dedicated in-flight child care service. So far 300 cabin crew members have been trained using material from the world-renowned Norland College (think Harvard, but for aspiring nannies). "Of the initial 300 volunteers, all are female and 'the majority' have had some previous childcare experience," an Etihad rep told MailOnline Travel. Another 200 nannies are expected to finish their training -- which includes a focus on child psychology and sociology -- and take flight by the end of the year, reports Arabian Business. 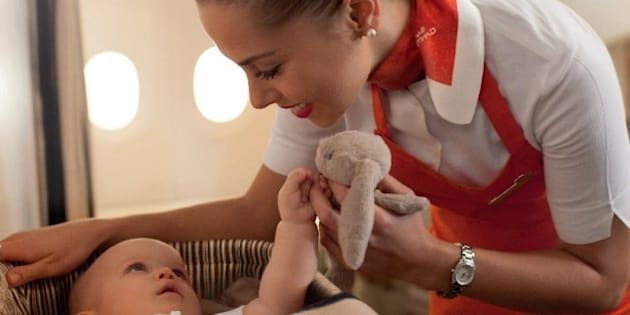 The U.A.E.-based airline says their nannies will be pretty much a Jill-of-all-trades and assist families in the little things like replenishing bottles, fetching snacks to tougher tasks like keeping the little ones entertained. But the nannies won't be going in empty handed. The orange-apron-clad nannies will carry kits filled with stickers, cardboard, straws and other various materials for arts and crafts, notes News.com. They'll also be trained in the art of origami and get this -- magic tricks. Kids too old for arts and magic tricks can go on guided tours of the plane once the flight has settled down. Etihad 's service is a first for airlines but the idea of flying nannies in actually older than you think. In 2011, Nanny In The Clouds was created to pair nearby nannies with parents in need of extra help flying with babies and toddlers, the same way parents can use craigslist to sell old cribs or strollers. While Mary Poppins will always be the original flying nanny, the push for extra help during flights comes as different proactive approach to dealing with children on planes. In August, Singapore's Scoot Airline announced a child-free zone. But, according to U.S. travel expert, Eileen Ogintz, in-flight nannies could be much more helpful than banishing kids from part of a plane. “It could possibly be a game-changer. It’s just a really smart idea and especially if you’re going to have a parent who has more than one child or one parent has to take one child to the bathroom, or take care of one child,” Ogintz told ABC News Travel.